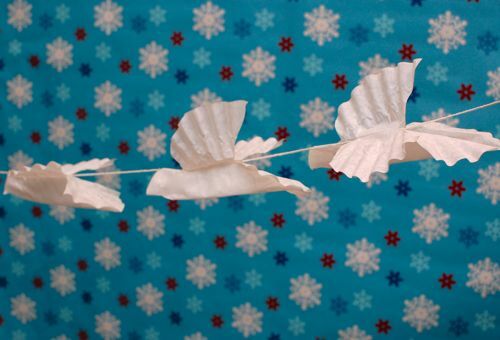 Emily and I made a pretty dove garland, and it was made using our new favorite art supply — coffee filters! These were so much fun to make!! 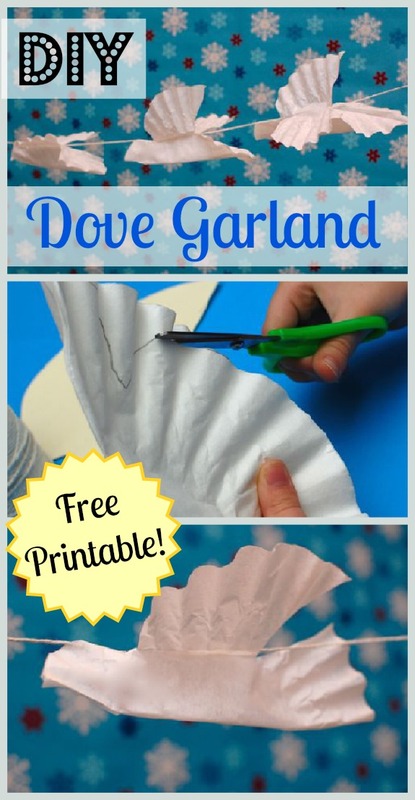 If you have some coffee filters on hand, you can download our template, and print it out on card stock, to make a dove garland of your own! 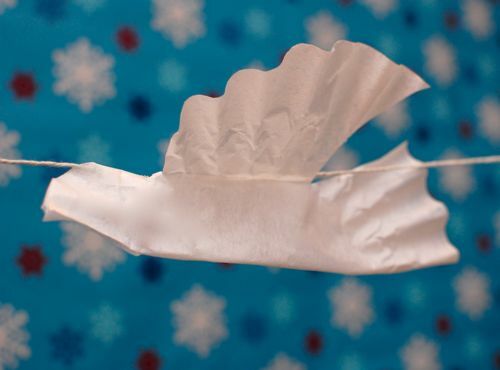 Fold 2 or 3 coffee filters in half and line up the pattern so that the belly of the dove is on the crease of the fold. 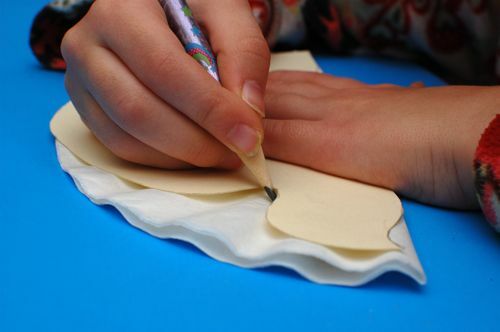 Invite your child over to trace the pattern! Cut out your doves! Since the filters are thin, you can cut 2 or 3 at a time. Separate your beautiful birds! They may want to give one another a kiss! Attach your birds along some string with tape. Ours are in the kitchen, and every time there is a slight breeze, they look like they’re flying!! 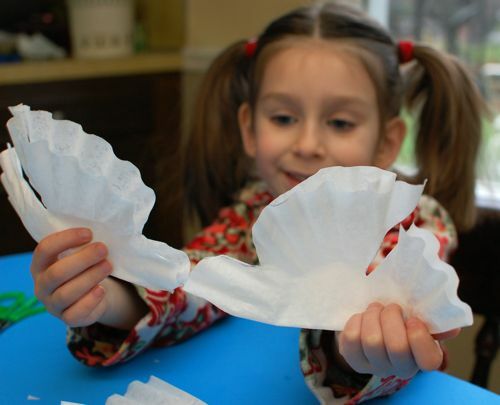 We have another fun and frugal coffee filter craft coming soon (Clara LOVED it! 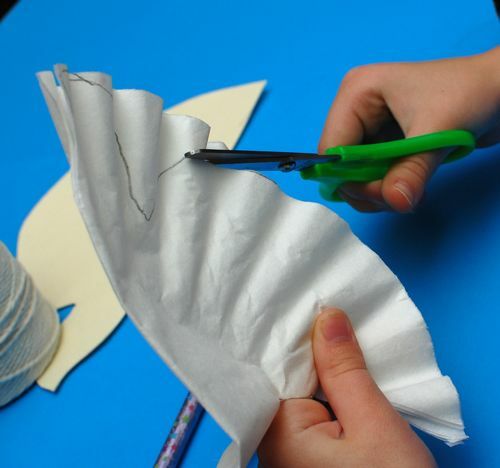 ), so get some coffee filters and craft along with us! Somewhere in this world, there is a person who really really really wants a cup of coffee, but, alas, has no filters. I’m having far too much fun crafting with these. You can’t stop me now! Muhahahaha!!!! Thanks, Maryanne! They are fun to make!! Nice idea. I have to ask about the snowflake background, is that a wall or some type of decoration? It’s so pretty with the doves. It is wrapping paper — my fave thing to use for backgrounds in photos! I love the way the curves in the coffee filters make the natural curves in the wings. I love it. Thanks so much! I think they look like neat feathers!! They are fun to make! I love the way you always make cute backgrounds for your craft posts, it adds polish and pizazz to your pictures– mine usually have dirty dishes on the kitchen counter and/or cat tushies walking by in the background- LOL!! Those are adorable. I might even be willing to consider parting with a few of me dear coffee filters to make them (although with my coffee habit, maybe not…). And that is a brilliant idea to use wrapping paper as photo background. Mine is usually my floor, or wall or an overly crowded counter. If it’s any consolation, I bought a pack of coffee filters at the dollar store that are strictly for crafting purposes. I’m so glad I did!! Have fun! Wow! So simple and beautiful. As a dove should be! So simple but so effective. I like that it is all about the cutting and no need for colouring. Not sure if my coffee drinking husband will approve! Shhhhh.. I won’t tell. Your secret is safe with me! 😉 Have fun! Oh, good point about the tape!!! What are homemade dinosaur eggs? Those sound like lots of fun! I’m going to go away now. Beautiful doves! Awwww… what a great story!! Thanks for sharing it — makes me want to treat the girls to some cupcakes! And I LOVE that you are planning a craft a night for the advent calendar!!! Yay!!!! This is such a cute craft, and it will work so well for spring too. Thanks for the template! Yes! Perfect thing for the snow day! Thanks! These are cute. Might have to try this one. Have to ask– what size coffee filters are you using? I printed out your template and it was much to big for our coffee filters, but I eyeballed it and made my own, but seriously — what type of coffee filters for future reference? You have made so many cute things with those coffee filters. Really like the doves. I shrunk the template and made these out of cupcake liners. They turned into some really cute little doves! I forgot in the last post to say “Thank you!” for sharing this! Wow, this is really cute! I wonder if I paint the beak and end of wings black… would they look like seagulls??? ?